The interface between tool and user is a critical component of tool design and even subtle changes can have a marked effect on how the tool works. Take this beautiful Thomas Turner tenon saw for example, the grip is reasonably vertical with a pronounced bulge in the back. To understand the reason for this we need to consider the 'hang' of the handle. A tool with a straight handle (like a gents saw or a carving knife) gives a great deal of control. Wafer thin slices of roast beef or finely executed joinery... In contrast a tool with a more vertical handle (like a steel framed bowsaw or a plane) is all about maximum transfer of power. In this example we have a bit of both but the emphasis is on power. English backsaws can be steered left or right for the first few strokes, after that the kerf, gravity and the set (the amount by which the teeth protrude left and right from the saw plate) take over and do all of the steering for you. 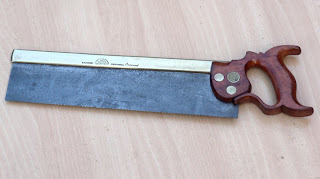 To begin the cut with this saw you would grip at the top with your thumb and extended forefinger and relax the rest of your hand to maximise your control. With the workpiece secured in the vice so that the cut is plumb , all you have to do is feel for the zero moment when the back is directly over the teeth and gradually allow more of the saw's weight rest on the workpiece. With a new saw you have the advantage of being able to observe the reflection of the timber in the side of the saw plate too - if the reflection seems to carry on straight through you know the saw is plumb. With an old one you need to be more conscious of feeling for vertical, the weight of the saw is all in the heavy brass back, making it more 'tippy' so the point of balance should be relatively easy to feel for. Once the kerf is established you can relax your thumb and forefinger and tighten up a touch with your little finger and the heel of your hand, this changes the grip from the top part of the handle to the bottom part - from control to power. By this stage there is no steering to do, the kerf is holding the spine perpendicular over the teeth, the spine is providing the weight to keep the teeth engaged and the set is ensuring that the left and right teeth are bearing equal measures of the work so the kerf stays straight. The faster you go on the push stroke, the more material you will remove with each pass, and as long as you don't grip too tightly and pull it off course, the cut will continue dead plumb and true. Whether you are squeezing at the top for control or at the bottom for power, your grip should always be relaxed enough that you can feel the soft flesh of your fingers give a little each time you switch from pull to push, it really is a very light touch indeed. With sharp teeth and a well balanced set I'd be happy to bet this saw will easily eat half inch oak at a rate of an eighth of an inch with each stroke. A new one with a much thinner plate and harder modern steel would possibly manage double that. If you fancy having a go at fine tuning your own saw handle shape we have Atkinson Walker tenon and dovetail saws available in kit form with full instructions and downloadable templates. The Pax 1776 range were also designed to be adjusted to suit the individual user, the finish on the handles is just straightforward Danish oil (tung oil) so any alterations you make can be easily blended into the original finish.